In multi-access topologies such as broadcast(Ethernet) or non-broadcast(Frame-Relay), rather than all routers exchanging LSA information with each other, it is more efficient that one router gathers all the information from others and announce the feedback later. So, first of all, we elect a Designated Router (DR) , and at the same time, we will elect a backup of the DR (Backup Designated Router: hereinafter BDR) so that the rolling roles can be handed over as soon as the consolidator goes down. For DR , a router with OSPF Router priority value (Cisco, Default value = 1) high is chosen. 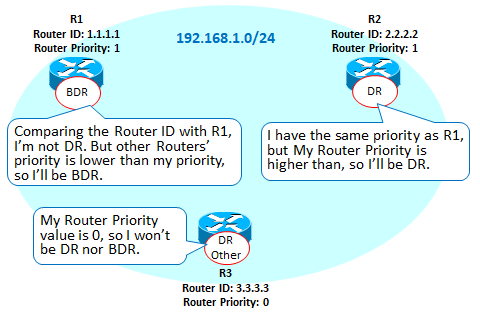 If the Router priority value is the same, a router with the higher router ID is chosen. 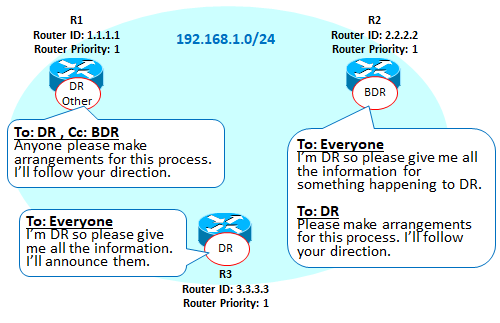 The BDR is the same rule as above, and a router with a higher Router priority value or a higher router ID is chosen next to DR. 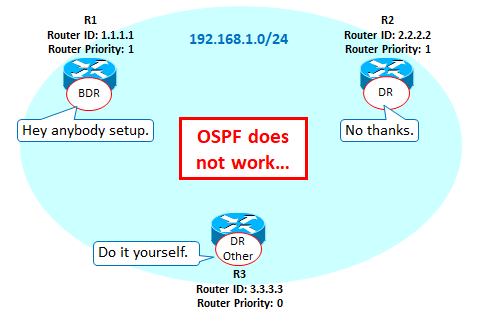 However, when the Router Priority value is 0, neither DR nor BDR is chosen, so if the Router Priority is 0 on all the routers in that segment, OSPF will not work.